Clyde, since you asked about “pipe and fittings,” I’m assuming you are referring to the RV waste piping systems. Standard ABS fittings continue to be used in the manufacture and repair of RV drainage systems. Most every RV contains Schedule 40, plastic ABS for all P-traps and drains as well as vent stacks. 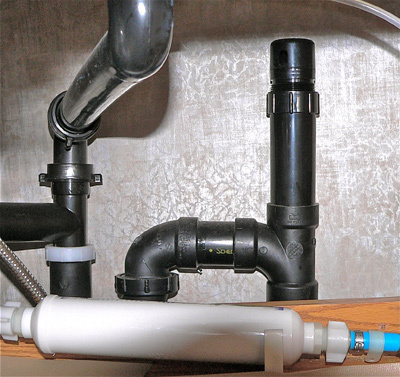 (In the photo here you can see a sink continuous waste, a P-trap and an anti-siphon trap vent device). Some components, such as the termination valves, are bolted, (using adapters), rather than cemented, but the majority of RV manufacturers still use cemented fittings for simple connections such as elbows, tees and wyes, in both the black and gray waste systems. Now if you meant cemented fittings for the distribution of the fresh water, the norm today is cross-linked polyethylene, (PEX) tubing. It used to be the gray polybutylene tubing and before that, cemented PVC and CPVC pipe and fittings and copper tubing. PEX is much easier to install and certainly less expensive and lighter in weight than copper tubing, which you may still see periodically in some custom installations. There are a few different connection methods used with PEX fittings including a variety of clamps and rings, but none involve glue or cement. The fresh plumbing system today enjoys fully the advantages of flexible tubing rather than rigid piping for the distribution of the fresh water. But the waste systems still employ cemented ABS pipe and fittings.